Green Bay Packers quarterback Aaron Rodgers looks to pass during the first half of an NFL football game against the Miami Dolphins, Sunday, Oct. 12, 2014. Green Bay Packers quarterback Aaron Rodgers looks to pass during the first half of an NFL football game against the Miami Dolphins, Sunday, Oct. 12, 2014, in Miami Gardens, Fla. In 1994, I had only been watching the NFL for a couple of years. I lived in Hawaii, where the closest thing to a home team we had was the Pro Bowl — which pretty much made me a Dallas Cowboys fan. I griped when it seemed like the Miami Dolphins were on TV every week. But that changed on Nov. 27, when I watched the Dolphins come back from a 17-0 third-quarter deficit against the New York Jets, culminating with Dan Marino’s legendary “Clock, Clock, Clock” play with 30 seconds left that led to the game-winning touchdown. It made me a Dolphins fan for life.1 It blew my young mind. As my obsession with football increased, my passion for the Dolphins did as well.3 But in the decades since, I’ve had my heart broken one too many times, and I’ve become numb to Dolphins results. For a few minutes on Sunday, Green Bay Packers quarterback Aaron Rodgers brought those feelings back. With 22 seconds left in the fourth quarter and trailing by four points against the — my! — Miami Dolphins, Rodgers completed a pass inbounds. He rushed to the line and snapped the ball with 13 seconds left, on what everyone seemed to think was going to be a spike — he was selling it so hard he deserved a Razzie4 — but it wasn’t. Rodgers flung the pass down the right sideline to Davante Adams, and Adams ran it out of bounds at the 4-yard line. First-and-goal, seconds remaining. The Dolphins took a timeout, and in the minute or so between that completion and their final play, I was a young Dolphins fanatic, hoping that I wouldn’t have my heart broken again. On the next play Rodgers threw a game-winning touchdown. Aaron Rodgers is something of an enigma. I’ve written about him several times before, pointing out that he’s statistically one of the best quarterbacks in football — maybe ever — but he takes few risks when his team is down and rarely leads the Packers to comeback victories. But with this win against the Dolphins, along with his Week 2 comeback against the Jets, it appeared my theory of Rodgers was on shaky ground. So I decided to look into his comeback conundrum more deeply — was it due to bad play? Or bad luck? Bad defense? Something else? Nothing at all? So bravo, Aaron. The Hacker Gods, who rule over this terrestrial simulation from their higher order reality much as Odin rules over Midgard from his perch in Valhalla, did everything in their power to get me to recognize your brilliance. They’ve sent me the ravens Huginn and Muninn to change my thought and mind. Perhaps they’re even daring me to eat them. And perhaps someday I will, but not today. 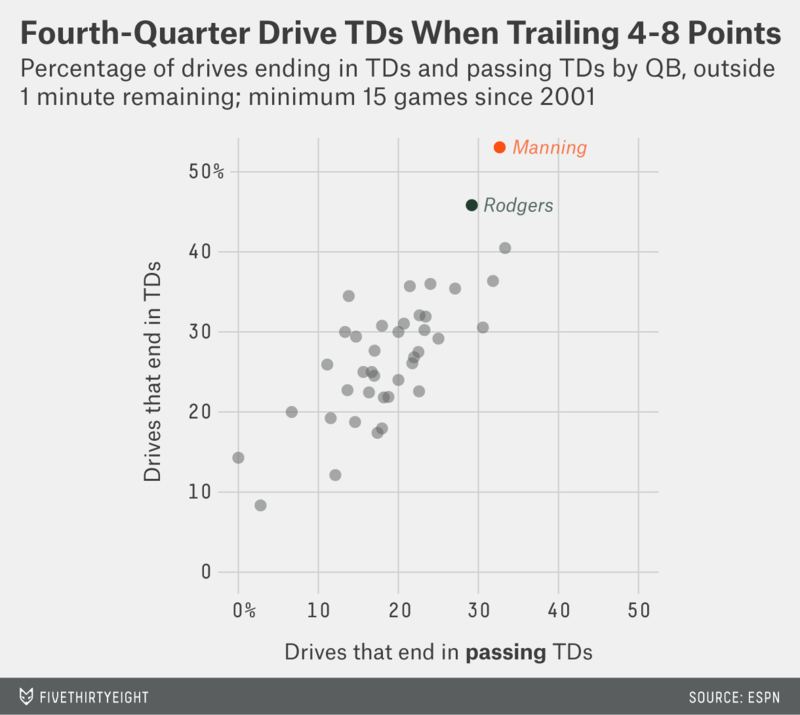 While I applaud Rodgers’s fourth-quarter driving efforts, breaking down his game more thoroughly has made me more convinced that he’s too cautious. For this chart, I’ve taken quarterback drives in the second half of games and broken them down into four categories: 1) games in which the quarterback’s team is more than a touchdown behind (down 9 or more points); 2) games in which the quarterback’s team needs a touchdown to tie or take the lead (down 4 to 8 points); 3) games in which the two teams are within a field goal of each other; and 4) games in which the quarterback’s team is ahead by 4 points or more. I’ve then plotted the percentage of such drives that end with a touchdown versus the percentage of those games won. (The bubble size is the number of drives.) I’ve highlighted the results for Rodgers and Manning, and noted their interception percentages. When leading by 4 or more points in the second half, both Rodgers (6.2 percent) and Manning (7.9 percent) throw a pretty low percentage of interceptions. About 30 percent of their drives end in touchdowns (29.8 percent and 29.5 percent, respectively) and both win at a very high rate (90.9 percent and 92.9 percent of the time, respectively). When the game is close — up or down 3 or fewer points — Manning’s interception rate drops a little (to 5.8 percent), while his touchdown percentage goes up a little (to 31.4 percent). Overall, Manning is still winning 77.7 percent of these games, while Rodgers’s (8.3 percent interception rate, 26.6 percent TD rate) winning percentage drops all the way down to 55.1 percent. When their teams are down 4 points to 8 points (i.e., they need a touchdown to win), both Rodgers’s and Manning’s TD rates shoot way up (Manning: 45.7 percent, Rodgers 40.0 percent). Manning’s interception rate also climbs (10.9 percent), while Rodgers’s drops (7.3 percent). Rodgers is winning a smaller share of these games (31.3 percent vs. Manning’s 44.9 percent), but it’s one of his best showings overall (and includes the scenarios in the intro above). It’s when the quarterbacks’ teams are down 9 or more points in the second half that you really see the difference. 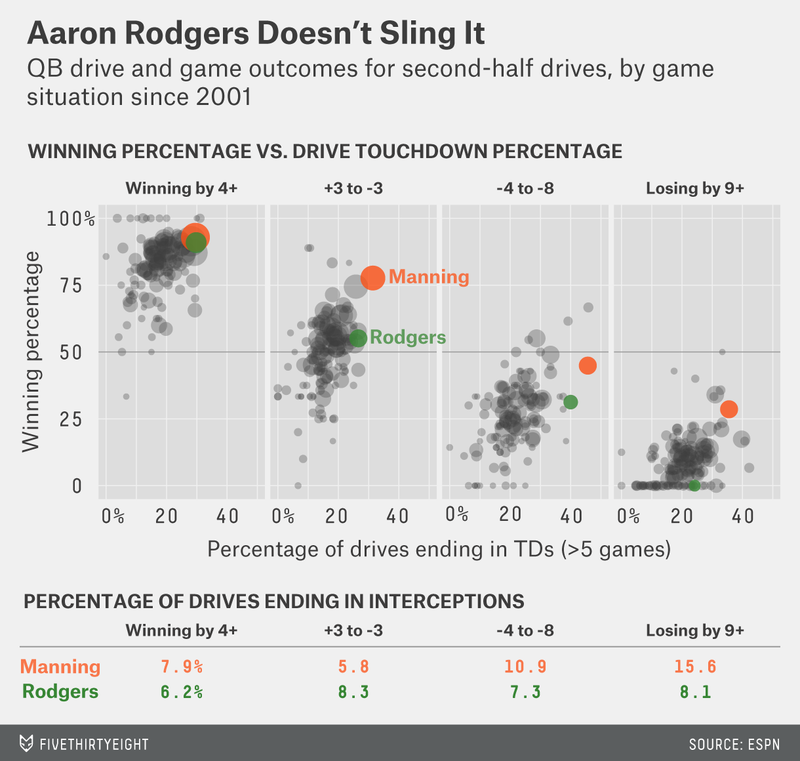 Peyton Manning throws interceptions on 15.6 percent of his drives, compared to Rodgers’ 8.1 percent. And for that, Manning is punished … by winning 28.6 percent of these games. Rodgers, meanwhile, wins 0 percent. That’s right, Rodgers has zero comebacks of 9 or more points in the second half. Ever. Judging any QB in relation to Peyton Manning is setting him up for failure. But the starkness of the difference is pretty amazing. Rodgers has zero wins in 21 games while Manning has 14 wins in 49 games, with Manning throwing interceptions nearly twice as often. If you need one stat to demonstrate the gunslinger hypothesis (i.e. that you can throw too few interceptions as well as too many), that would probably be it. 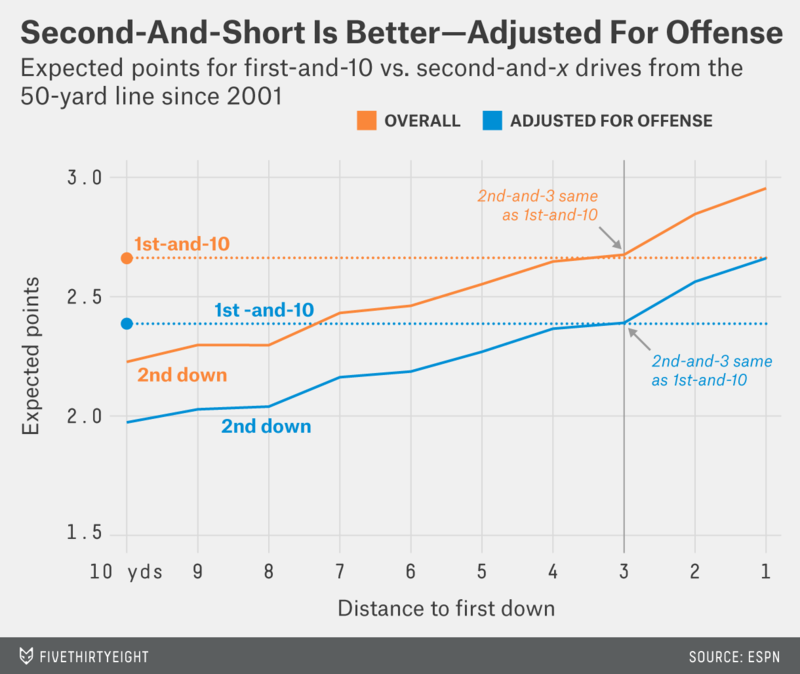 Last week, I introduced a chart meant to show how second-and-1 is basically preferable to first-and-10, even if it means sacrificing a couple of yards to get it. This has tactical implications (if a running back can’t get at least a couple of yards past the first-down marker, he should go down just before it), and can even affect how we evaluate players (for example, I love to see a running back get a lot of 9-yard runs). @skepticalsports did you tease out the possible selection bias of better teams being in 2nd and 1s than teams that have 1st and 10s? It’s a very fair question. If stronger teams attempt a disproportionate share of second-and-1s, they would inflate the value of second-and-1 in my analysis. This is something I’ve looked into before, and indeed, stronger teams do account for a larger share of second-and-1s. However, they also take a larger number of first-and-10s. The net difference is negligible, and my result holds: For a typical team, second-and-short is still a few yards preferable to first-and-10. For those interested in how I got there: I projected expected points per drive based on down, distance to first down, and distance to the end zone.5 I’ve plotted the results of this for second-and-x at midfield as the top line below, and marked the value for a first-and-10 at midfield as the top dashed line. Second down becomes about as valuable as first down when it’s second-and-3, and is up to a third of a point better at second-and-1. I then used the same model, except I adjusted for team strength bias and calculated the results based on what we would expect for an average team,6 and plotted those the same way. We can then repeat this process to adjust for strength of defense, but it follows exactly the same dynamics: Teams are more likely to give up second-and-short by just about the same amount they’re more likely to give up first downs. Our winner this week is Ryan “He was a first-round draft pick?” Tannehill, who threw two interceptions in the second quarter against the Packers, both with his team trailing, yet managed to claw his way into the lead before the Dolphins succumbed to Rodgers’s dirty trickery. Also, following that fake-clock debacle, Tannehill kept his composure well enough to complete two passes on a last-ditch, lateral-laden desperation play. I love those plays, though they obviously never work. A well-executed lateral play can double a team’s chances of winning — OK, maybe from half a percent to 1 percent, but still. Not going all-out on a last-minute play is just throwing away fractions of a win. For least valuable, a case could be made for Matt Prater, who went 1-in-3 in his first week back from suspension and his first week with the Detroit Lions. Detroit’s ice-cold kicking continues, and its season total of 20.0 points below expectation is now just a sliver behind San Francisco’s 2012 record of 20.6. But, fortunately for Prater, the Lions didn’t need his kicks in their comfortable win against the Vikings. The most dramatic miss of Week 6 was by the Cincinnati Bengals’ Mike Nugent, who shanked a 36-yard field goal as time expired in overtime against the Carolina Panthers, leaving the two teams tied. But perhaps lost in that drama is the fact that the Panthers’ Graham Gano also missed a 38-yard attempt in the third quarter. Both Gano and Nugent made three of four field goals in a game where four would have gotten them the win, but because Nugent’s attempts were slightly harder (made FGs of 44, 38 and 42 yards), Gano (made FGs of 39, 44 and 36 yards) wins least valuable kicker of the week. Dan Bailey (class of 2011), Justin Tucker (2012) and Blair Walsh (2012) are this generation’s golden triad of kickers, and their infiltration of the record books has likely just begun. The Jacksonville Jaguars’ Blake Bortles had 336 yards, one touchdown and one interception. He keeps the top spot by virtue of yardage and still being the top draft pick. The Oakland Raiders’ Derek Carr had a stellar day in his first action since his coach got fired. In the Raiders’ loss against a strong Chargers team, he managed 282 yards and four touchdowns. As I’ve mentioned repeatedly, yards and touchdowns are the main predictors of rookie success, so this was a good game for Carr regardless. But a rookie who throws four TDs is standing on pretty hallowed ground, let alone four TDs in a game by Week 6 of his rookie year11: The last (and to Pro-Football-Reference game-finder’s knowledge only) player to do so was Hall of Famer Fran Tarkenton in 1961. The median career Approximate Value for a (retired) QB on this list is 92! For comparison, when evaluating draft prospects, I sometimes use a “success” line of 32, which so far nine of the 12 QBs on this list have surpassed. From Carr’s draft position, his chances of being “successful” were about 28 percent. Is it silly to read so much into one crazy performance? Maybe a bit, but there’s such uncertainty with rookie QB prognostication that Bayesian reasoning comes into play. 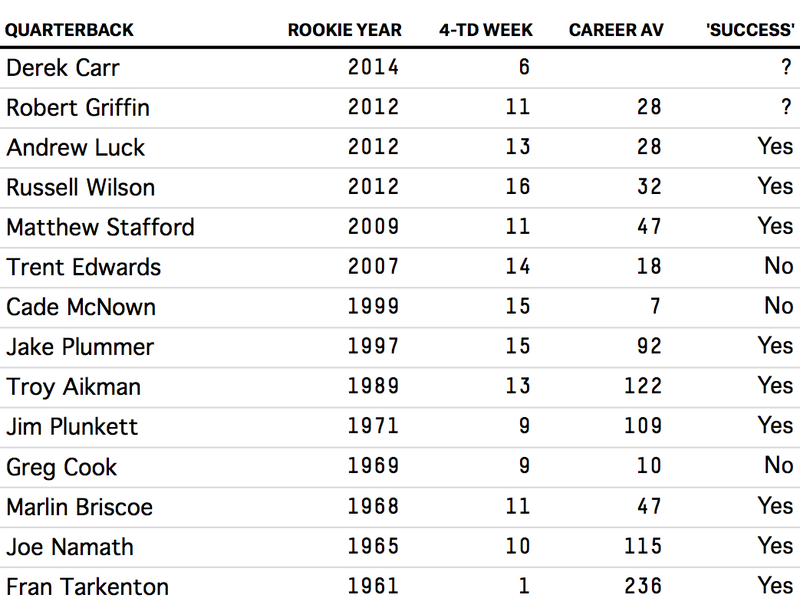 Carr’s four-TD game as a rookie is extremely rare, but it’s less rare among great quarterbacks. Rapidly updating beliefs in light of new information is what Bayesian inference is all about. So the question is: Which is more unlikely, that Carr is bad and had a freak performance, or that Carr is good and had a very good performance? The Minnesota Vikings’ Teddy Bridgewater had 188 yards with no TDs and three interceptions in the Vikings’ game against Detroit. As usual, the interceptions don’t mean much for a rookie, but the lack of yards and TDs do. In three games, Bridgewater has yet to throw a touchdown (though he has one TD on the ground). The New England Patriots’ Jimmy Garoppolo did not play, but the news for him is that Tom Brady had a stellar week with over 300 yards and four TDs. This is bad for Garoppolo’s chances of getting into the game anytime soon, as Brady might have more left in the tank than we thought. On the other hand, the Patriots recovering from dire straits to their present 4-2 record may also be good news for Garoppolo: If the Belichick-led Patriots are able to maintain their high level of performance indefinitely, that means Garoppolo’s chances of having a good career will converge with his chances of being the Patriots’ heir apparent. The Cleveland Browns’ Johnny Manziel did not play. And his starting competition seems to be getting better and better. Journeyman quarterback Brian Hoyer — who had only started four games in his five-year career prior to 2014 — is now 3-2 this year with an NFL passer rating of 99.5 and a Total QBR of 75.4 (good for seventh in the league). I’m taking the New Orleans Saints (2-3) vs. the Detroit Lions (4-2). This is an extremely high-leverage game for both teams. Per the charts from Week 1, having a record of two wins and three losses is the second-highest-leverage game for a team that won 12 or more the previous season (the Saints won 11).12 Of 2-3 teams that won their sixth game, 61 percent made the playoffs. Of those that lost their sixth game, only 6 percent made the playoffs. On the Lions’ side, looking at the charts for all teams no matter their previous season, 4-2 teams that win their next game make the playoffs 75 percent of the time, teams that lose it just 50 percent. But these are also two franchises and two quarterbacks at a crossroads. Drew Brees and the Saints have five 10-win seasons together, including three straight 5,000-yard seasons prior to this year and a Super Bowl win. Matthew Stafford has put up big numbers but not a lot of wins. Collectively, they hold six of the top nine spots on the leaderboard for most passing yards in a season. Other interesting angles include: Can Brees defy concerns about his age as deftly as he defied concerns about his height? Are Stafford’s numbers soft, or is he the next big thing? Can some coach not named Bill Belichick keep a franchise competitive for more than a few years? CORRECTION (Oct. 16, 11:36 a.m): An earlier version of this article incorrectly stated which team took a time out during a fourth-quarter Green Bay Packers drive in their Sunday game against the Miami Dolphins. It was the Dolphins, not the Packers. In fairness, looking back on this it seems pretty antiquated. There were 22 seconds left on the clock when he made that pass — teams would never let up in that spot today. Until that moment, I never knew myself. In 1996, Miami hired Jimmy Johnson, one of the architects of the Hershel Walker trade, and an innovator (sometimes for worse than for better) in economic-style draft analysis. Seriously, why defenses aren’t assuming every “spike” play is a fake is beyond me. Also, the more emphatically the quarterback gestures that he is going to spike, the more likely the fake is on! This was done with a regression to points scored that used goal distance and “down/distance,” the latter as a single categorical variable. By including team season as a categorical variable and then setting its value to 0. All in all, the first down line drops slightly less than the second-and-short line: The gap between second-and-1 and first-and-10 drops from 0.32 expected points to 0.27 expected points. OK, it just sums the standard deviations of points vs. expectation and contribution to margin of victory. 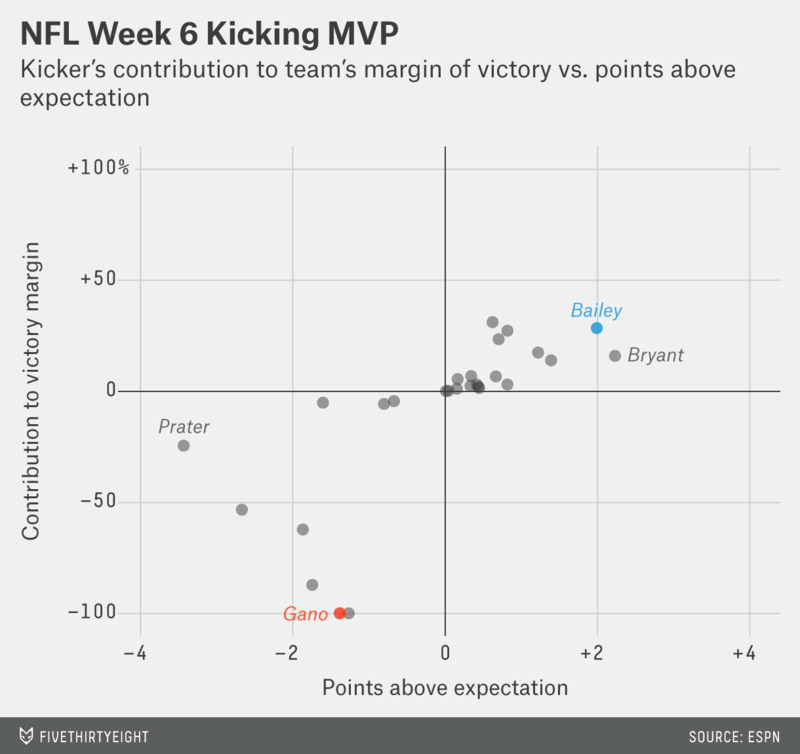 I’ve changed up my most/least valuable kicker chart a little this week by capping the margin of victory contribution at 100 percent. Recall Mike Vanderjagt had only one attempt of 50+ yards in his perfect season. Counting “true rookies” only. Meaning quarterbacks drafted in the same year they played. The highest is the last game of the season for teams that are 9-6.